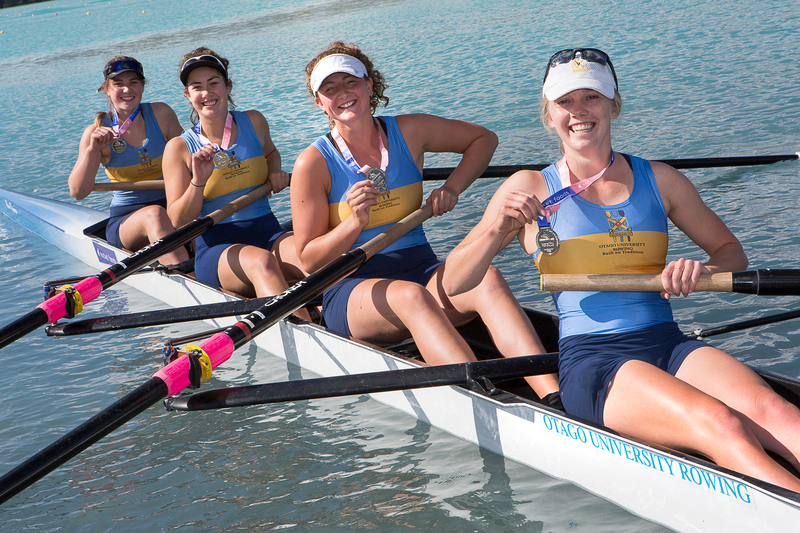 The Otago University Rowing Club crew of (from left) Gabby Hunter, Josie Cook, Caoimhe Dempsey and Sydney Telfer celebrate after winning the silver medal in the women's senior four at the national championships on Lake Ruataniwha at the weekend. On a hectic final day of racing, after wind played havoc with Friday's racing, Hofmans won the women's senior single in 9min 38.04sec. She then won the club single title in equally impressive fashion. In the women's club double sculls, North End crew Haylee Budd and Emma Wallace finished second, five seconds behind the winning North Shore crew. The Dunstan Arm four of Angie Lochaden, Rebecca Kingan, Camille O'Connor and Heather Breen, coxed by Sophie Smith, won the women's intermediate four. That four also teamed up with other rowers from the same club to finish second in the women's club coxed eight. Jez Nicholson-Kelly and Oscar Cochrane, rowing for the Otago club, finished second in the men's club coxless pairs. In the women's senior four, Otago University Rowing Club's Sydney Telfer, Caoimhe Dempsey, Josie Cook and Gabby Hunter took second place. The four then teamed up with a Canterbury crew to race in the eights and picked up a bronze in the senior eight. In the women's under-19 double sculls, Ella Fry and Sophie Sinclair, of North End won gold, just under two seconds in front of a Timaru crew. The women's intermediate double sculls was a benefit for the Dunstan Arm club. Mackenzie Ealson teamed up with Paige Furrie to win gold while Sophie Smith and Malia Banks finished second. Cook and Hunter teamed up to take for the bronze for the Otago University club in the club pairs. In the under-19 fours, Otago performed well, the crew of Angus Kenny, Will Edwards, Oscar Cochrane and Nic Chamberlain, with cox Fergus Parks, finishing second in the final. Simon Smith and Greg McLaughlin won the men's senior double. In the premier races, Emma Twigg made an impressive debut in her first national event since the Rio 2016 Olympics, taking gold in the women's premier single sculls, representing Waikato RPC. The women's premier eight was won by Central RPC's crew of Jackie Gowler, Ella Greenslade, Kerri Gowler, Beth Ross, Ruby Willis, Georgia Nugent-O'Leary, Kirstyn Goodger, Ruby Tew and coxswain Ella Greenslade. Robbie Manson achieved his third premier class victory of the regatta with the retention of his men's premier single sculls title. Across six lanes, Manson, Mahe Drysdale, Jordan Parry, Harrison Somerville, Brook Robertson and Karl Manson lined up to contest the title. Drysdale took silver and Parry bronze. In one of the fastest times recorded on the Lake Ruataniwha course, the men's premier eight was won by Auckland RPC in a time of 5min 35.08sec. Southern RPC took silver in 5min 36.83sec and Central RPC claimed bronze in 5min 37.95sec.